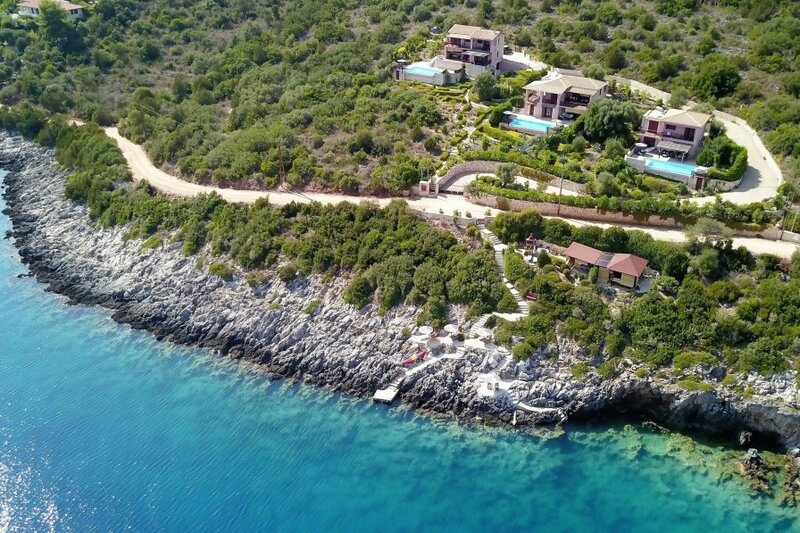 Come to touch the sea and sun in 3 seafront villas EDEN, 3 pools,3km from civilization, privacy, green quiet peaceful paradise, view to Ithaca, just few steps from private access to crystal blue sea. Forget hectic hotels, crowded beaches and hordes of tourist. Come and spend non-traditional vacation in a truly relaxing style in the middle of paradise with its own access to the sea. Villa is one of 3 independent villas Eden and is located in absolutely quiet and peaceful place just on the coast 3km from nearest vilage Evgiros in the Bay of the Rising Sun with view of the mythical island of Ithaka and Arkudi. Villa in largest in Eden and has 2 apartments with private entrances, 2 kitchens, 2 living rooms.perfect for 2 families,several couples or individual guests. First floor has 2 bedrooms every with bathroom,1 extra bed can be put in 1 bedroom or in dining room. Ground floor has 1 bed room and 2 beds in living room. 1 extra bed can be put in bed room or living room. Apartment has 2 WC and bathroom. Villa offers privacy with private swimming pool with modern ozone cleasing system, large shady stone terraces with outdoor seating and sun beds. Villa is made from stones and have A/C in every room and screened all windows and doors.All terrases and rooms has stunning sea view. We have bought colonial equipment for villas from distant Indonesian island Bali. Areal is connected to the sea, where you will find place for sunbeds,umbrellas and inbuilt steps to the watter. Perfect for swimming and snorkeling. Sea area has small private bar for your refreshment and relax. Our bay is also good for jogging. For lovers of sauna we have private Finish sauna for 4-6 pers.